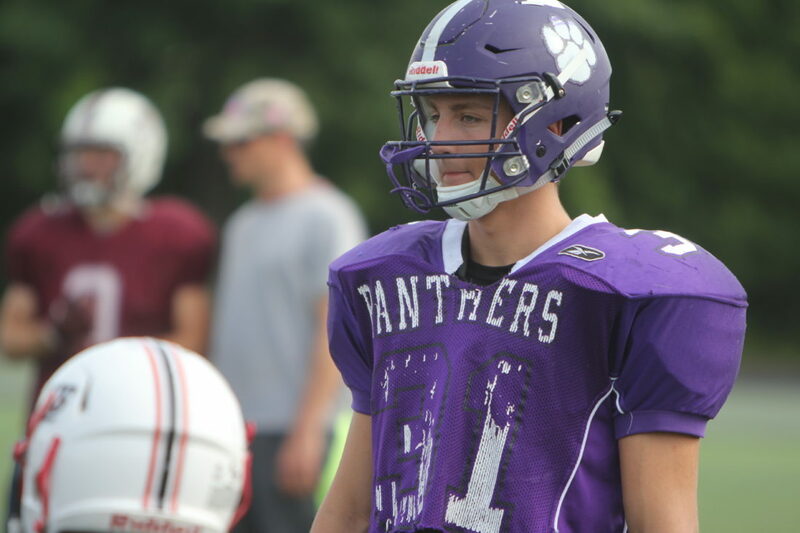 Staff photo by TOM KING Jarret Bieren is one of three former Nashua South standouts who will be calling Saturday's CHaD All-Star Game their last hurrah for foorball. The others are Derek Downing and Alex Amigo. Game day has arrived, and for a few former Nashua High School South players, today’s eighth annual CHaD East-West All-Star Fotball at the University of New Hampshire’s Wildcat Stadium will be their final one. While former Panthers quarterback Sean Holland and lineman Derek Chiavelli will continue their careers in college, this is the end of the line for West team wideout Derek Downing, back Alex Amigo and linebacker Jarret Bieren. “I was really excited to be part of this group,” Bieren, who is headed to UMass-Amherst to study computer science, said. “It’s gong to be pretty sad, honestly. Ibut I feel it’s time to move on. I’ve enjoyed playing football throughout my life. Bieren was a running back, a tight end, and an inside-outside linebacker. Outside linebacker was his favorite spot. “It’ll mean a lot to have my last game as an All-Star game,” Bieren said. Amigo and Downing will room together, ironically, when they begin school at UNH. Remember, Downing began the season with the tough story of his grandfather having a heart attack in the stands at Pinkerton Academy early in a game. He’s hoping his grandfather will be able to attend today. “He doesn’t go around a lot but he’s in good condition,” Downing said. Amigo was a three-sport athlete at South, and now this will likely be his last organized athletic event. Merrimack two-way player Joe Eichman (running back, defensive back) will get his first taste of playing at what will be his new home field in the fall at UNH. Holland and Milford lineman Michael Bouchare are two of the West captains for today’s game, along with Bedford’s Connor Robert, Goffstown’s Andrew Duval (UNH-bound and this past season’s NH Gatorade Player of the Year), Hanover’s Moises Celaya…. The West will be looking to take its fifth win in the seven years of the game. The East has some beef up front with Winnacunnet’s Ryan Hanson (6-2, 305) and Pelham’s Jacob Kirane (6-2, 300), and the talented QB Cody Graham of Portsmouth.